Unit1 Martial Arts Fitness was started by Dave Cartawick, 5th Dan and founder of the British Karate and Kickboxing Association (BKKA). Based in a large, purpose-built premises near to Chesterfield town centre, Unit 1 has gone from strength to strength over the past few years and now offers a wide range of martial arts and fitness classes throughout the week and across the weekend. Unit 1's approach to learning martial arts is simple: we welcome everyone, whatever your goals or level of fitness. Most of our coaches walked through the doors of Unit 1 as beginners themselves and know what it is like to take that first step, so you will always be welcomed with a friendly smile and encouraged to develop at your own pace. As a member of Unit 1, you will be taught by fully qualified and experienced coaches who will aim to develop your confidence, flexibility and fitness through disciplined training under controlled and supervised conditions. Unit 1’s premises are designed specifically for fitness classes and martial arts training. Our main training room has padded flooring, which helps avoid injury, all the equipment you will need to train in the martial arts, including pads, gloves and sparring dummies. In our second training room, we have a range of equipment for fitness classes such as body combat. For anyone wishing to visit, or watch family members train, we have a dedicated seating area with vending machines and coffee machines, so those watching can make themselves comfortable. 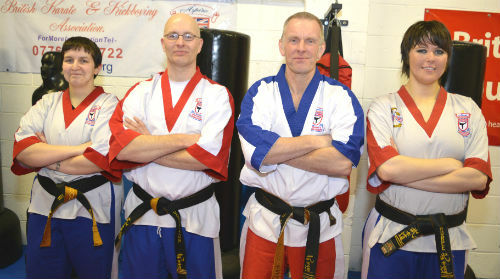 We also have a Unit 1 shop, where we sell a range of martial arts equipment and clothing. This helps saves money for our students who often have to buy equipment online and pay for high delivery charges. Unit 1 is located in a convenient location for anyone who needs to travel to attend our classes. We’re located just on the outskirts of Chesterfield town centre and have plenty of free parking available. We believe that fitness and martial arts training should be affordable for everyone. We don’t ask our students to commit large sums of money up front like many other places, instead we operate on a ‘pay as you train’ basis. We find that this flexible approach suits our students and their families. If you are interested in starting martial arts classes or joining one of our fitness sessions, we suggest that you come down to Unit 1 for a visit. You can talk to Dave or one of the other instructors and watch one of the classes taking place. This will enable you to see for yourself how friendly and welcoming it is at Unit 1. As well as providing intensive training for martial arts, Unit 1 believes in giving back and being a positive force for good in the local community and beyond. We work with a number of charities throughout the year and provide opportunities for young people to experience the martial arts. Every year we host a charity event called the ‘Kick-a-palooza’ to help raise money for young children with cancer. We also work with Chesterfield College, providing martial arts sessions for different students as part of an extra-curricular programme, including Foundation Studies students who have learning difficulties or physical disabilities. We encourage all of our students to get involved in our demonstrations and charity work, which helps create the family feel that Unit 1 has become known for. If you are interested in working with Unit 1 for charity-based events and activities, please contact us directly to discuss your idea.